We hope to hear more from the Scollay descendants, and also hope that they feel free to use this site to help them better understand their family's history and its place in Boston history. In February 2013 I received the following email from Dr. Sam Forman, a Harvard faculty member who wrote: "I encountered your website on Scollay family genealogy. As an author who has delved deeply into one of the clan, you might find my recent postings of interest. Feel free to share them with other Scollays, who are encouraged to contact me if they have information pertinent the these historical Scollays: Valentine to Miss Mercy Scollay"
I encourage all of you to read Dr. Forman's poigniant essay, and if you interested in reaching Dr. Forman to please contact me here. One of the most frequently asked questions about Scollay Square (aside from the ones about Sally Keith's tassels), concern the Square's origin. Just where did the name Scollay come from? Did the family who provided the name do anything besides that? Do any family members still live today, and if they do, what do they think of their family's namesake? One of the members of the Sons of Liberty was a man named John Scollay. While we know that his family came to Massachusetts from Scotland's Orkney Islands, members of the Scollay family place his precise lineage in question. It had been written - and accepted as fact - that John's father, also named John, had leased the Winnisimmet Ferry in 1692, and ran it for several years, but according to one family researcher, "it's possible that the ferry owner was "actually a son of William Scollay (brother of 7.James Scollay) who also emigrated to Boston." We hope to help the Scollay family find the answer. Meanwhile, let's get back to John Scollay. John obviously achieved some stature in Colonial Boston, as he was elected Fire Marshall in 1747, a position he held for thirty-five years. In 1761, along with about fifty other men, he signed a petition which was sent to King George III protesting the illegal actions of the British revenue officers. A strong supporter of colonial claims against the empire, he was chosen to Boston's board of Selectmen in 1764. The honor was repeated in 1773, and the following year he was made chairman, a title he held until 1790. Although his participation in the Revolution was historically overshadowed by that of the more prominent and outspoken revolutionaries such as Adams, Otis, and Hancock, John's contribution was nevertheless important. Without individuals like John Scollay supporting the cause, resisting the British might not have been possible. John Scollay had ten children, eight of them boys. The youngest, named William, was also active in the community, becoming Clerk of the Market in 1788 and Selectman from 1792 to 1795. Following in his father's footsteps, he acted as Fire Marshall from 1792 to 1806. On August 20, 1792 he was named a colonel in the Boston Regiment, a title he is said to have carried proudly. In the middle of Court Street, at the intersection of Court and Tremont Streets, were a series of buildings which extended down Court Street to the head of Hanover Street. Nearest the intersection was a two-story brick building. The rest of the property, which narrowed as it extended west toward Hanover Street, was covered with wooden structures one or two stories high. Here one of the oldest printing houses in Boston, Green & Russell, transacted business around 1755. Part of this property also included some land at the base of Beacon Hill, on which stood a three story mansion. Russell, who had become owner of the property in the 1760s, sold it to William Vassall for three hundred pounds, in 1774. Vassall moved into the mansion where he lived for two years, when, following the British evacuation of Boston, the loyalist was forced to make a hasty retreat of his own. Patrick Jeffrey, a real estate investor, was able to buy the property for a little more than half of what Vassall had paid, about one hundred and sixty pounds. The source of Jeffrey's money deserves some discussion, as it was the cause of some titters among Boston society around the time of the Revolution. A woman named Mary Wilkes Haley had arrived in Boston to inspect the property of her deceased husband, Alderman Haley. When this seventy-year-old woman married the thirty year old Jeffrey (who was in charge of the estate), Boston was both shocked and amused. No one was surprised, however, when the marriage broke up and Mrs. Haley returned to England. Jeffrey, now quite well off following the union, was able to make purchases such as the Vassall estate. In 1795 Jeffrey sold the Court Street property (which included the buildings in the middle of the street) to Colonel William Scollay. Jeffrey kept the Beacon Hill estate for a few more years, eventually selling it to Gardiner Greene. (There will be more about Greene and his property later) Scollay moved into the brick building nearest Tremont Street, and rented out the others. He named his new home on Court Street Scollay's Building, although the name also came to apply collectively to the other, smaller wooden structures on the property. Considering the infamy a soon-to-be constructed Athenaeum on Howard Street would have, it is interesting to learn that the more intellectually motivated Boston Athenaeum (which now resides on Beacon Hill) was located in Scollay's Building from 1807 to 1809. The Provident Institute for Savings had its first branch here from 1823 to 1832. The building was also a popular location for lawyers since it was so close to the Court House, which had been built nearby on Court Street (near the old State House) in 1810. The grade of Court Street was so steep at this time that someone walking on the Beacon Hill side of the street could see over the lower buildings on Scollay's property to the other side. When Court Street was leveled, Scollay's building gained a basement. There, a popular barber of the early 1800s named Bob New practiced his trade with great success, and Boston's best tea shop, its largest thread store, and a toy store all did business. William Scollay had willed the buildings to his heirs and upon his death in 1809 they leased the property to a Mr. Dimmock. After having the two story brick building inspected by two engineers, who pronounced the foundation safe, Dimmock had two stories added, making the structure four stories tall. Scollay's Building, now one of the tallest in Boston, became the centerpiece for this part of town which, thanks to a growing transportation system, would evolve into a bustling commercial center. Public transportation in Boston after Independence consisted mostly of stage lines which ran to and from the "suburbs." As mentioned before, the Square was centrally located near the docks, Beacon Hill, and downtown. The intersection of Court and Tremont streets became a transfer point for early nineteenth century commuters. 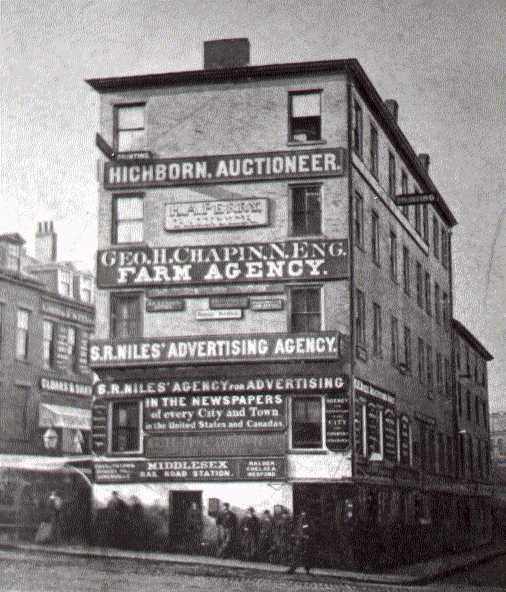 The Charlestown line ran every seven minutes and ended its run in front of the brick building owned by the Scollays. So did the Dorchester, Malden, and Cambridge coaches. Since there was no official designation for the stop, conductors merely used the name of the building to indicate where the trolley had stopped. "Last stop, Scollay's Building! Everybody off," they would shout. Travelers on these lines would often tell their friends to meet them at "Scollay's Building," and after a while the area became known as Scollay's Square. In 1838 the popular designation was turned into an official one when Boston gave the name Scollay Square to the intersection of Court and Tremont Streets. It is still so narrow that two carts cannot pass with safety and as there are several shops opposite belonging to the town, much out of repair, the town is asked to widen at this point which will make the shops more convenient and fetch equal rent (The Scollay's, 1906). On January 7, 1868 the Scollay family ended its association with the Scollay building when they sold it and the property on Court Street to Arioch Wentworth for $100,000. Three years later Wentworth sold the building to the city for twice what he had paid the Scollays. That year, the city finally granted the wishes of many traffic-weary citizens when it tore the remaining Scollay's building down, leaving the Square completely open. The removal of Scollay's Building created a problem for topographers, those students of the city's natural and man-made features. "The open space is known as Scollay Square, although it is in fact the most irregular of triangles," one wrote soon after the building was torn down. "Two of the sides, and those two which form almost a right angle with each other, are in Court Street, and the third is Tremont Row. The removal of the buildings has left one of the most remarkable cases of confusion in street nomenclature anywhere to be found" (Memorial History of Boston, 1881). Despite this intellectual confusion, there was no attempt to rename the intersection, and Scollay Square remained, at least in name. I am a direct descendent of the Scollay who gave the square its name. While the surname "Scollay" rarely appeared after the death of William Scollay, one lineage has been carried on through his daughter Lucy C. Scollay who married Benjeman Whitwell. Their daughter, Lucy Cushing Whitwell married William Parker. Their son, William Whitwell Parker married Harriet Esther Bell. Their son, William Bell Parker married Helen Sutliff. I am their son, Scollay Cortlandt Parker. Consequently I am in the fifth generation of that lineage (Letter from Scollay Parker to Jerry Williams, January 4, 1987). Fred Scollay, a television actor, is also a direct descendant of John Scollay, although while being interviewed by Williams he said that he prefers to place a slight French accent to his name "to keep people from misspelling and mispronouncing it!" That's undoubtedly a good idea, since the name of the Square is constantly being mispronounced as "Scully" even by those (including this author) who claim to be experts on the subject. To the Scollays we owe more than just thanks for giving the Square its name. Both John and his son William were civic minded men who risked everything in their pursuit of American Independence. Today, if you visit the Massachusetts State Capital building, you will see inscribed on the cornerstone, along with other, more familiar names from the Revolution, the name of William Scollay. My name is Tamesin Eustis, and I am researching the life of Miss Mercy Scollay, with the goal of writing her biography. I became interested in Mercy through her brief engagement to Dr. (and Major General) Joseph Warren - one of my own ancestors (William Eustis) was a student of Dr. Warren's, and he was also acquainted with Miss Scollay. With the results of my research of the past few years - using collections available to the public - I could easily tell the story of Mercy's life. But I would welcome any additional details that may be resting in private hands: reminiscences by family members, more letters to or from Mercy (she was an avid letter-writer), samples of her needlework, etc. These would enrich and enliven the narrative and help me bring her story to life. Thanks so much in advance for your interest and consideration! I though you would be interested in a recent discovery I made regarding the Scollay Square Scollays and the Orkney Scollay family genealogy project I'm working on. I recently analyzed a paper on the Scollay family written by Dr. Hugh Marwick in the early 1900s. He is quite the authority on Orkney genealogy and there are some interesting parallels to the article you gave me written by Alexander S. Porter in 1906 and read to the Bostonian Society Council in the same year. I have information from another Scollay researcher that identifies yet another Scollay family in Boston in the late 1600s. This family was headed by a John Scollay (b.20 June 1665) and who married a Lydia Grover and who had children Lydia, Grover, Hannah, John, Susanne). I have yet to connect this lot to Orkney or to the Scollay Square bunch but there is no doubt in my mind that they are related. I very much enjoyed your online history of Scollay Square and hope you can help me locate information on "Greenough's Museum", which is described in an 1891 article in New England Monthly as "facing Court St., between Brattle St. and Cornhill". It is not clear in the article if the museum still existed in 1891. Apparently it was the predessor to the Austin and Stone/ Boston Museum around the corner on Tremont Street. I cannot find anything about it by searching Google and reading through numerous articles. Think you can help us about Greenough's Museum? Please email us and we'll let Katherine know!